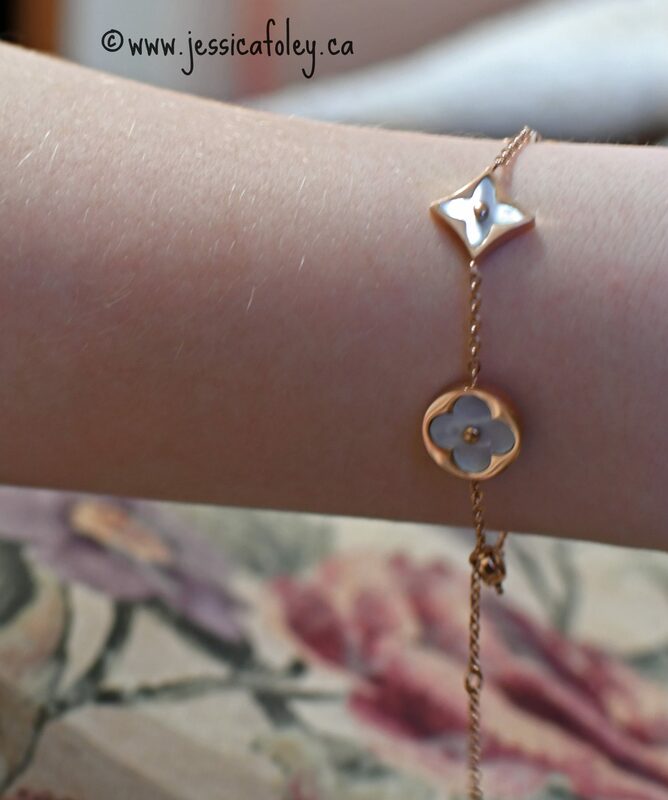 Judy Luxury sent me a beautiful rose gold designer bracelet. A few of the elements on the bracelet are inlaid with what looks like mother-of-pearl, but I’m not sure. I can’t find many real details about it on their website. I love the colour rose gold. I feel like I can pretend it goes with everything. (Though I think silver and gold go with everything too, so maybe style is not my strong suit.) 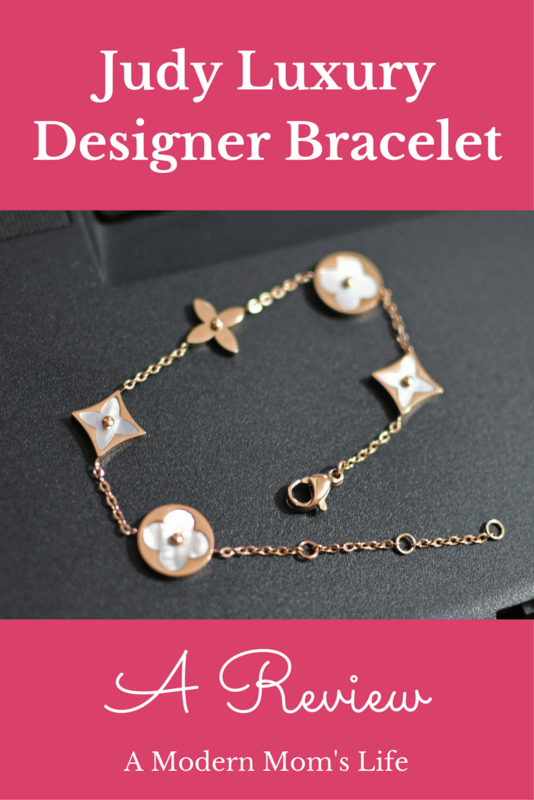 It’s an elegant and simple bracelet, and I think it would be comfortable for everyday wear. Both Emma and I did notice the pieces flip over sometimes while wearing the bracelet, but I think that would happen with any bracelet of this style. I will say my interactions with my contact at the company were not overly helpful. They shipped me the bracelet in a padded envelope, and in a regular jewellery box. There was no paperwork inside the box or in the packaging anywhere. Maybe if I had actually purchased it there would be a packing slip or receipt, but I actually struggled to remember the name of the company, or why I had gotten this package. My daughters and I will enjoy wearing this designer bracelet. It’s very unlikely I will order anything else from Judy Luxury – mostly because I’m not an online shopper. I like physically seeing items before I purchase them. The prices on Judy Luxury’s website are good, but the shipping is a lot, so if you’re going to order from them I’d suggest getting a few items at a time! If you would like to read more of my product reviews, click here. If you are interested in working with me, visit my Work With Me page, or contact me. I think it’s very pretty. I’m a little sad that the company wasn’t so great to work with. But you win some, you lose some I guess! Hi Jess! The bracelet looks stunning. It is a very reasonable price too. Such a shame you didn’t feel like you had the best experience with the brand. Thanks so much for sharing with #MMBC. Have a great weekend.